At Mountain View Chiropractic we provide chiropractic care and related therapies to all members of the community, from newborns to great-grandparents. Because all bodies are different, all of our treatment plans are tailored to you and your needs. We use all available resources, both holistic and scientific, to improve and/or maintain our patients’ physical health. In fact, if for some reason your ailment demands a different type of care, or would benefit from coordinated care with another doctor, we will not hesitate to refer you to one of the accomplished specialists in our network here in the Valley. Our approach encompasses two goals: first, we want to help you feel your best. Second, we hope to enable and inspire everyone to participate in our community helping others, be it at the local or global level. We help our patients make small changes that add up to a big difference over time. Each appointment is a chance to lessen pain, improve muscle function and promote healing so that you can exercise, eat better, say “yes” to an outing with friends, play with the children in your life, or volunteer at a local charity. When you feel better, you can have an even greater impact in our world. Resourceful – Our professional training and over thirteen years of experience allow us to perceive and treat subtle issues while our dedication to researching new techniques keeps us up-to-date on new innovations in the field. Responsible – Our focus is to provide Services that make you well. We have no interest or need in providing unnecessary treatments where there would be no benefit. Real Results – Please read our Testimonials to learn how our treatments have helped our patients. In addition, we are a community-driven and focused practice. 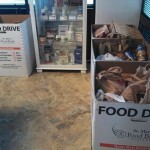 We sponsor an annual food drive every year and also offer special services to returning US military Veterans. Dr. Renée is a Sports Medicine Crew Captain for the Arizona Susan G. Komen Breast Cancer Three Day Walk and she offers her expertise as a Sports Medicine Volunteer at various sporting events in the area. For efforts with Susan G. Komen and other fundraising efforts, Dr. Renée was recognized with a Community Service Award from the Arizona Association of Chiropractic in 2010. Now that you know our approach and philosophy, visit Our Services to learn more about the care we offer. Are you ready to make an appointment? You can Schedule an Appointment right now.